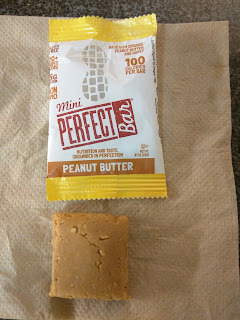 I don't really like granola bars, protein bars, and the like, but, sometimes I need convenient snacks to carry with me, or to make sure I have protein to supplement my sometimes ridiculous lifestyle, and bars work well for this. As such, I end up trying a lot of bars, surprising for an item I just don't generally like all that much. They produce 3 types of almond based bar: plain almond butter, almond acai, and almond coconut. I didn't try any of these, since I don't generally care for almond butter. Peanut options are Carob Chip, Fruit & Nut, Cranberry Crunch, and plain Peanut Butter (available as a mini only). Perfect Bars however lose out in the convenient factor, because they require refrigeration and have a shorter shelf life. "Creamy organic peanut butter meets organic honey meets 20 expertly-hidden whole foods." The first flavor they ever made was peanut butter, so, I started with this, their first, and signature, item. I tried a mini version, not really expecting to like these bars, and not wanting to invest in a full size bar. The mini was indeed mini, easily finished in 2-3 bites. The bar was a fairly solid texture, just kinda a block. Since I had it straight from the fridge, it was also cold, and crumbled a bit. I wonder what it would be like if it warmed up a bit? 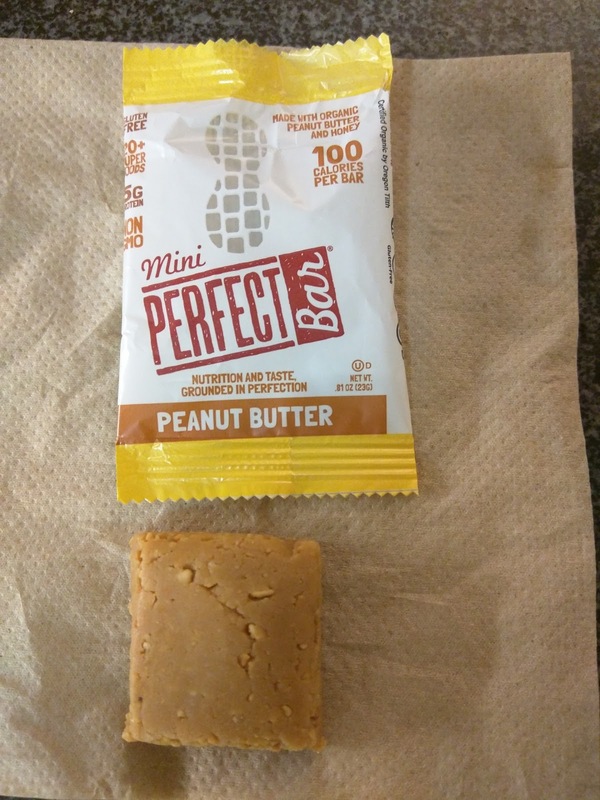 Anyway, my 2-3 bites was only 100 calories, which is decently low given that it is a peanut butter bar, and, shockingly, the first ingredient is indeed peanut butter. And you can tell. It mostly just tastes like, well, peanut butter. There was not a strange bitterness to it. There was not an awful aftertaste. It tasted like peanut butter, honeyed peanut butter even. As I said, the first ingredient is peanut butter, and the second is honey, so, it actually makes sense that that is what I tasted. The bar actually tastes like what it is made of. There are more ingredients in it, including "Dried whole food powders", which includes kale, flax seed, rose hip, orange, lemon, papaya, tomato, apple, alfalfa, celery, kelp, dulse, carrot, and spinach, but honestly, I didn't taste any of that. Notably, there is no "whey protein isolate", or any strange chemicals. The only not entirely obvious ingredient is rice protein, which never tastes as nasty to me as the other proteins commonly found in bars. Anyway, was this actually tasty? Well, not really. If it had some chocolate chips in it though, I could imagine liking it (they do make a version with carob chips, perhaps that would work?). Or just something to give it a bit more oomph. As it was, it was just a strange textured bar, that mostly tasted like honey peanut butter. 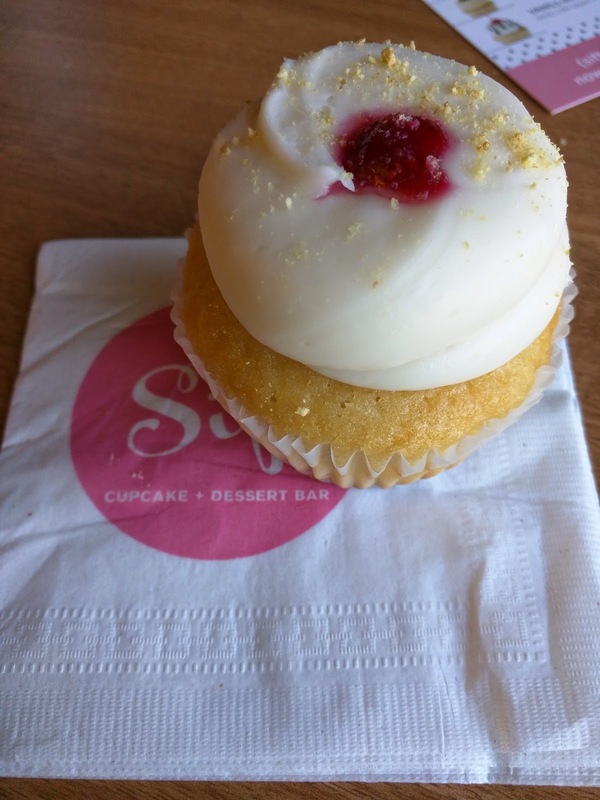 A while ago, I reviewed some fairly mediocre cupcakes from Sift Dessert Bar. I was not impressed. 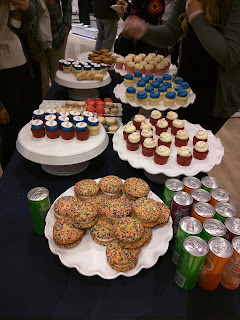 I didn't seek Sift back out, but, I was at an event recently that was catered by Sift. I avoided the cupcakes given my past experience, but was pleasantly surprised by everything else. Sometimes, giving a place a second chance is a good thing! I'll gladly try more of their creations now. The array of choices at this event was impressive. Cupcakes in an array of flavors. Macaroons in every flavor Sift makes. Whoopie cookies. Rice crispy treats. Even a few cruffles hidden amongst the macaroons. Since I remembered not liking the cupcakes much before, I skipped right past them, and moved on to the other goodies. 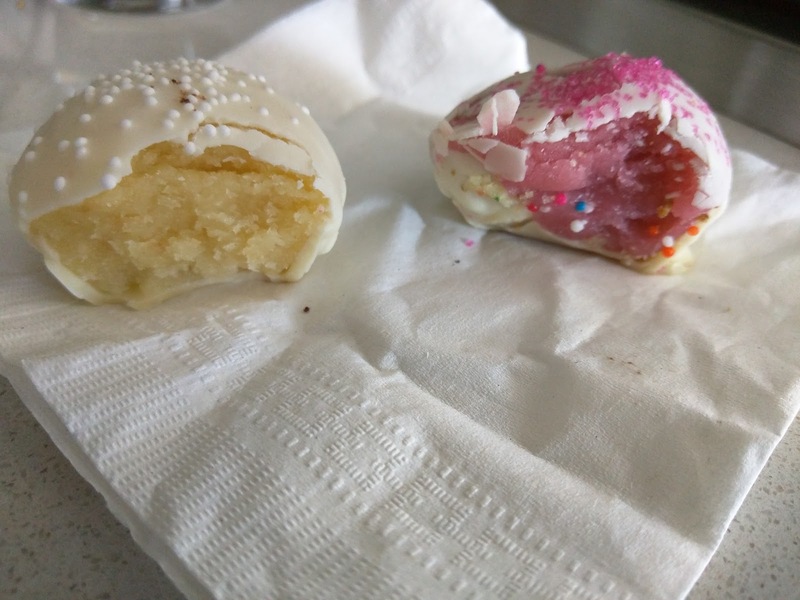 I also skipped the macaroons, because, well, I never generally care for macaroons, although, I'll admit, some of the macaroon flavors did sound interesting, like churro, margarita with salt, and piña colada. 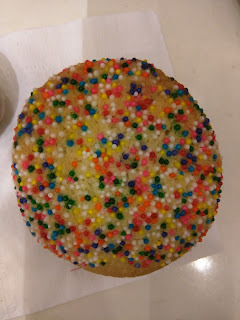 Rainbow Sugar Whoopie Cookie. $3. 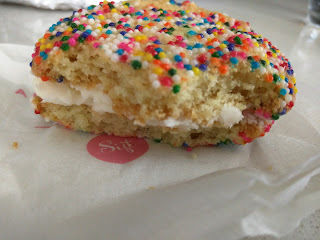 "2 Rainbow Sugar cookies filled with vanilla buttercream frosting "
The first item I grabbed was a cookie sandwich, dubbed a whoopie cookie, basically a play on a whoopie pie, but made with regular cookies rather than standard fluffy cake-like whoopie pie cookies, and filled with regular frosting. I grew up with whoopie pies, so, I was a bit skeptical of a "whoopie cookie". I also realize this is a bit of an add move in general, since I don't generally like cookies all that much, but, it caught my eye. Perhaps because it was so colorful, you couldn't help but notice the rainbow sprinkles. But really, I wanted it because it was stuffed with frosting. My general aversion to cookies isn't that I don't like cookies themselves, it is just that they are so boring that way. Why would I ever want just a cookie? But I also don't generally like cake. Its dry and boring. The only reason I eat cake is for the frosting. I could easily do without the cake part. Enter the cookie sandwich. Do away with the dry boring cake and still get the frosting. Jazz up a cookie significantly. This has potential. Sift makes 3 varieties of cookie sandwiches: classic chocolate chip, rainbow sugar, and salted caramel white chocolate chip. The later sounded the best to me, but, when I approached the display, they only had chocolate chip and rainbow sugar cookie sandwiches out. Of course, just a few minutes later, the ones I wanted came out, but I had already taken this one and felt rude going for another. Rainbow Sugar Whoopie Cookie: Inside. So, how was it? Well, it was about what I expected. A decent sugar cookie, not too hard, not too soft, and sweet. The rainbow balls were a fun touch for color and crunch. 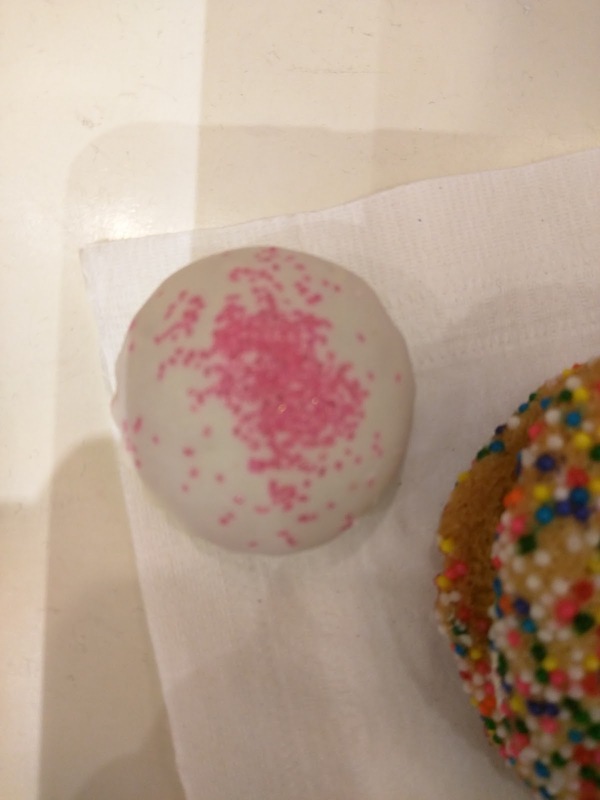 The filling was just plain white frosting, also sweet. Sweet on sweet, which I guess is to be expected. The frosting made the cookie more exciting, and the cookie served as a vessel for the frosting. But, still not that amazing. The salted caramel white chocolate chip whoopie cookie uses salted caramel buttercream, which certainly sounds more flavorful. And the chocolate chip one uses cream cheese frosting. Had I realized the frostings inside were different, I certainly would have gone for a different one. Overall, I'm glad I tried it, and I certainly liked it more than I would have liked a plain cookie or a piece of cake. But, not really my dessert of choice. Cookies are $1.25 each, and whoopie cookies are $3, basically, $0.50 for frosting. Cruffle: "Cake and frosting blended together. Hand dipped in chocolate." I also managed to grab a cruffle, one of very few, mixed in with the macaroons. It took me a little while to figure out what a "cruffle" was. The answer? Cupcake + truffle = cruffle. Cruffles are basically cake pops, without the stem. Sift makes them in the same varieties as the cupcakes. 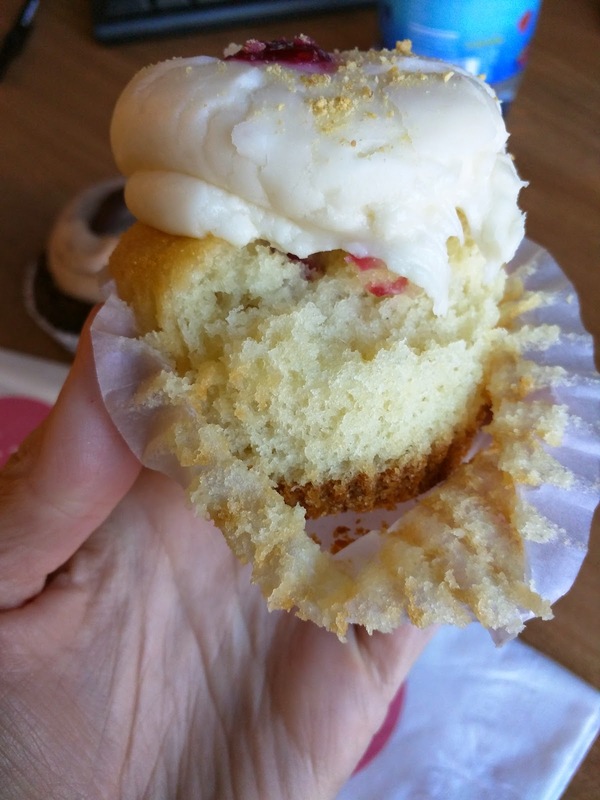 I had no idea what flavors I was getting, but this one turned out to be the cruffle version of their Pink Champagne cupcake. Limonatta and Pink Champagne Cruffles: Inside. "Moist raspberry cake with a delicious champagne frosting." It was ... pretty awesome. The raspberry flavor was sweet and flavorful, really quite delicious. I loved the texture of the inside, dense from the frosting blended with the cake. While I don't really like cake, um, I do like cake pops, or, in this case, cruffles. The white chocolate shell was sweet and the perfect thickness. It had a nice snap to it. Overall, the cruffle form factor was great, and honestly, makes more sense than a cake pop anyway. Everyone knows its more fun to eat with your fingers! "Lemon cake, lemon curd filling topped with Meyer lemon buttercream"
When I circled back through a while later, I saw a few more cruffles set out. Given how delicious the first one was, I grabbed another, again, not knowing what it was. It turned out to be the limonatta. Darn. I don't really like lemon desserts. But, I still loved the texture and the sweetness of the shell. For a lemon treat, it was a good one. Cruffles come in boxes by the dozen for $24. My office does funny things to motivate us sometimes. For background, we have the most incredible pastry team, who regularly churn out desserts that rival, and generally surpass, those of top restaurants. This is impressive in its own right, but even more insane given that they never repeat a dessert from day to day, offer up multiple desserts every day, and produce them for 1000+ people at a time. Our pastry chefs are my heroes. But this isn't about them. This is about our "reward" for being good during a fire drill. Yes, for real. In the past, to encourage us to properly exit the building during fire drills, they set up a Ben & Jerry's stand at the designated meeting point across the street. People did leave, but I think they generally grabbed ice cream, and then kept on going, not returning to the office. So this time, they did something a bit different: the gave us cupcakes, but, they didn't give them to us until we came BACK to the office. Doh. 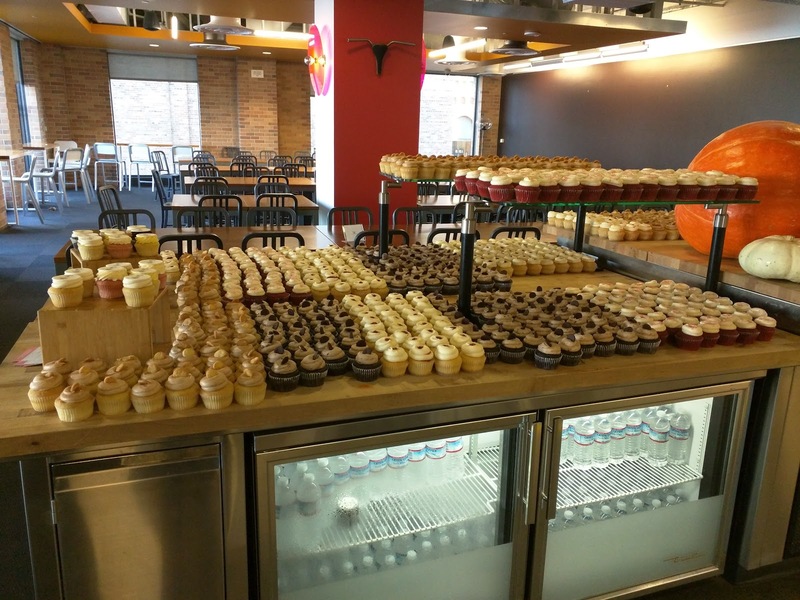 They didn't bake the cupcakes in-house, rather, they sourced from Sift Dessert Bar in San Francisco. Sift has several California locations, plus they ship nationwide. 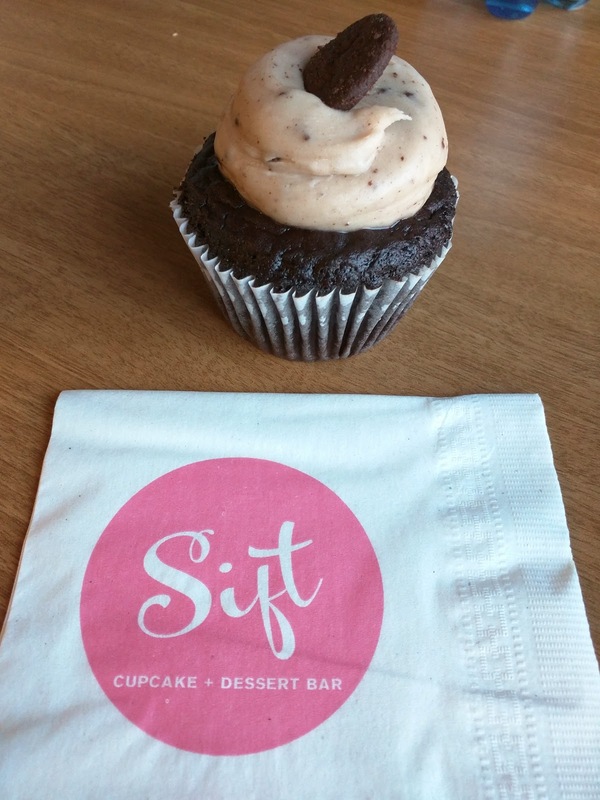 Sift's main focus is cupcakes, including gluten-free or vegan options if necessary, although they also make a few other standard items like macarons, cookies, brownies, pies (including a kahlua chocolate pie that I'd love to try), and cakes. They also get creative, offering up cupcakes a la mode, cupcakes blended into ice cream shakes, and fascinating sounding frosting shots. We had an assortment of four cupcakes waiting for us: Berry Good Cheesecake, Ohh La La, All for the Cookie, and Snickerdoodle. I tried all except the Snickerdoodle. None were very good. "Vanilla graham cracker cake, filled with raspberry jam and topped with cream cheese frosting". This one was the most pretty, so I started with it. In the base of the cupcake was graham cracker crumbs, as you can see here. They were just crumbs, not bound together by anything, which was a bit strange. If you took off the wrapper, it would have crumbled apart everywhere and made a mess. Protip: do not fully unwrap this cupcake! The cake was very dense, almost ... gummy. I didn't care for it. The jam inside was clearly raspberry flavored, but not particularly interesting. I did like the cream cheese frosting. Did this remind me of a cheesecake though? Besides the cream cheese frosting ... no, and besides the frosting, I didn't really want this. "Chocolate cake topped with cookies n' cream cheese frosting". I got the chocolate offering for Ojan, named All For the Cookie, but obviously tried it myself first. It was also a very dense, moist cake. Again a bit gummy. The frosting was ok, sorta Oreo-tasting. But very meh overall. "Our famous red velvet cake with cream cheese frosting". Unsatisfied with the other choices, I also tried the Ohh La La, even though I never like red velvet much. I didn't care for the cake, as it was all homogenous. I like a moister interior and a crunchy top, and this was all just the same, and a bit dry. The cream cheese frosting was the same as in the Berry Good, very sweet, a bit too sweet, but good enough. Overall, meh, but I liked the frosting. Pino's Pizza is a hole in the wall pizza place in Cleveland Circle in Brighton, near Boston. It is a friend's family's favorite pizza place. They have been visiting for years. It seems to be an institution among others too, as it has been around since 1962, which is crazy in restaurant years. Whenever he visits home, my friend always makes a trip to Pino's, with his entire family, including his elderly grandparents. It is a big ordeal, but a tradition and something they absolutely love to do. I've somehow not usually been around when they have gone, but this time, I was. I was assured I was in for a treat. Pino's is a no frills sort of place. You order at the register. They sell slices that are pre-cooked and just warmed when you order, or whole pies. They also have the makings for subs. I guess they also have some Italian dinner classics, like ravioli, ziti, shells, spaghetti, and assorted parmigiana, but we didn't order any of those. These folks come for the pizza, and only the pizza. It was lunchtime, and slices and subs seemed like popular items for others. 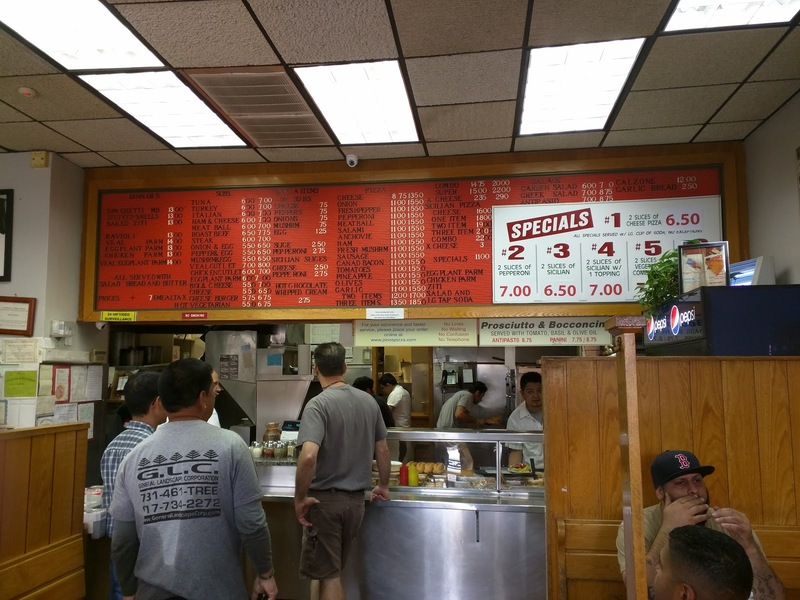 Once you order, you are given a number, and that is that. Pizza is delivered to your table with paper plates. Silverware and napkins are self serve. Classic toppings such as oregano, parmesan cheese, garlic, and red pepper flakes are available in shakers at the register. I said they go for the pizza, but one diner also wanted us all to try the cheesesteak. 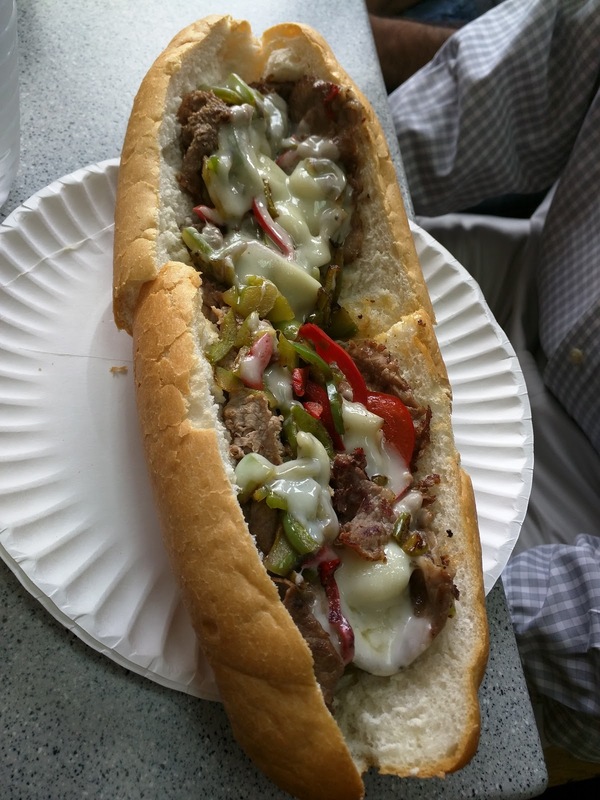 So we got a cheesesteak to share amongst everyone. The bread was soft and not very fresh tasting. The beef was well done (as in, cooked completely) and chewy. I don't really like cooked peppers. The cheese was nicely melted at least, but there wasn't much of it. 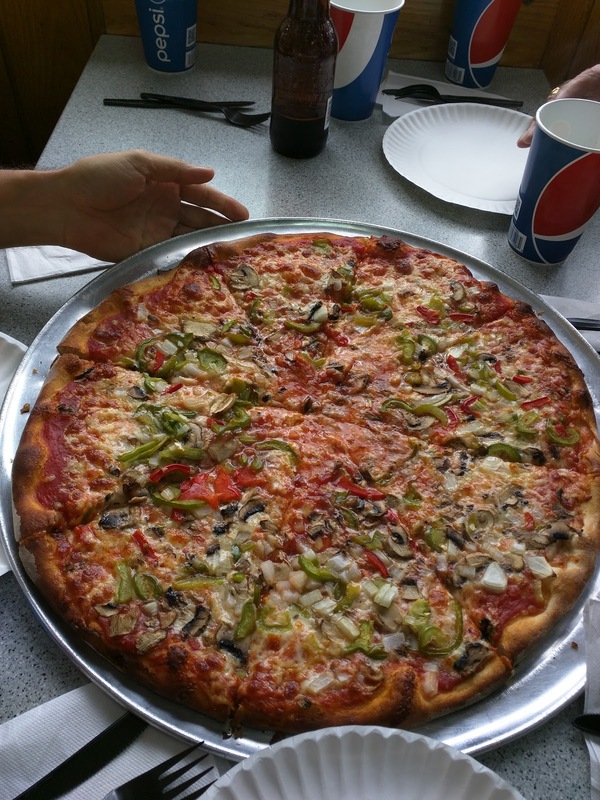 Large onion, peppers, mushrooms, "extra crispy". $18.50. 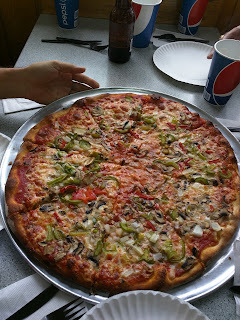 The first pizza we got was a large with onions, peppers, and mushrooms. I liked the onions and mushrooms, both were soft and well cooked. The topping amount was generous, nicely coating the pizza, and evenly distributed. I didn't care for the peppers, both red and green, but, again, I don't really like cooked peppers. The sauce was fine, simple tomato sauce. The cheese nicely melted. A bit greasy for my taste overall though. The crust was rock hard. Not charred in a nice way, just rock hard. But, we did order it "extra crispy", as that is how the person ordering likes it. The rest of us disagreed, but, this is her thing, so we went with it. I thought the crust had absolutely no flavor. No cornmeal, no oil, just ... rock hard brick of flavorlessness. We also got a pepperoni pizza and a small cheese. I tried a bite of the cheese, and it was much better, the crust not quite the same level of rock. I think if you didn't ask for it extra crispy, the crust would at least not be hard to gnaw on, but it wouldn't likely be anything remarkable. Overall, just simple pizza, not much more to say here. Clearly, not my thing, but, I'm not really one for pizza in the first place, and, I think this place is their favorite due to all the memories. I'll also throw in a shout out to the staff, who clearly know the family well, and treat them so very well. They always make extra pizza bread for his grandfather to take home, as he loves to have it for breakfast the next day with classic Persian feta cheese and herbs. Definitely an institution, just, not mine.